We develop expert systems or artificial intelligence systems which use sophisticated algorithms to select proper components from a myriad of choices by simply entering answers to simple questions. Once the answers are provided the program goes about evaluating the rules to determine the proper solution. This is far more than a simple table look-up. It ranks solutions when there are more than one and bases the ranking on the rules. Drawings, specifications and prices are commonly part of the solution. Please note that this expert system is now working on our website. Click on web expert system to view it. 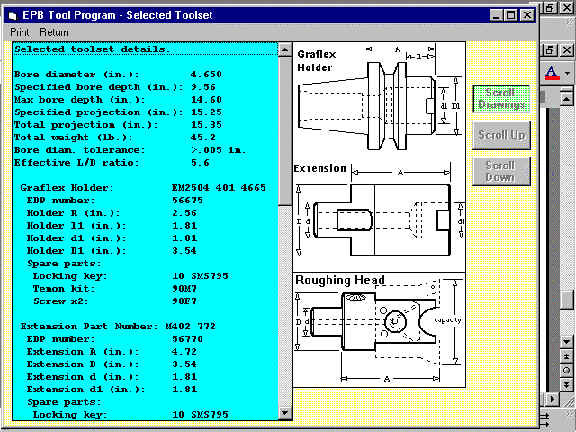 This example shows how an expert system can help develop a tool set solution to select a combination of extensions, reducers, adapters, boring bars and boring heads to bore a deep hole in a part. Notice the variety of information provided by the button choices. In this example we have tool flange type, taper, required tolerance, bore clearance and depth clearance.. There is virtually no end to the information which can be included. Each of these boxes lets the user enter application parameters. The first box asks for the diameter of the hole to be bored. The second box asks for the depth of the hole to be bored. The third box asks the user to enter the total tool projection including the bore depth and any other clearance distance. Notice the hole size range in the first box. The range goes from one inch to over 25 inches. Once the questions are answered the program evaluates the rules and puts together the solutions which are possible. In this example you can see the first and second choice tool sets. There are nearly 40 possible solutions so the ranking shown at the bottom of the choice can be helpful to evaluate alternatives. 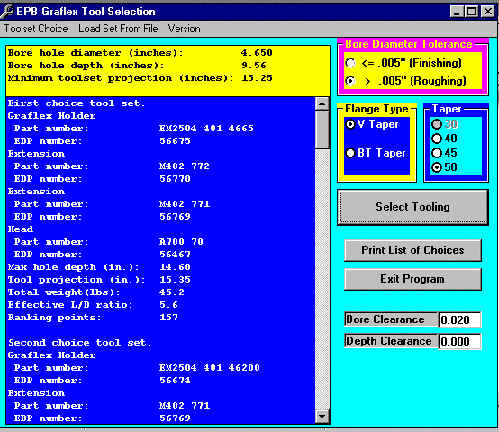 The choices can be printed for further evaluation or one tool set looked at closer on screen. This tool set solution can be examined on the screen along with the drawings or it can be printed for further evaluation. Notice all component dimensions and spare parts are included. To view this Expert System working on the internet click on the following link: Web Expert Sytem. This type of Expert System can be completely customized to meet your needs for about $10,000.